awfully big reviews: Warrior King by Sue Purkiss. Reviewed by Ann Turnbull. Warrior King by Sue Purkiss. Reviewed by Ann Turnbull. 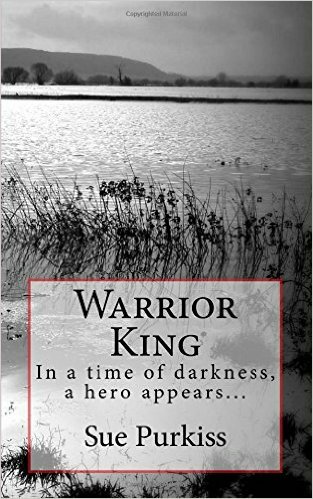 Warrior King tells the story of King Alfred from when he was a child - the youngest of five brothers and therefore never expected to reign - to when he was a fugitive king, driven into hiding on the Isle of Athelney in the Somerset Levels. From there he gathered his army, beat back the Danes, and eventually set up the Danelaw - establishing the eastern side of the country as Danish territory and concluding a wary peace. He even began to envisage a time when England might become one country. The story is written in a clear, accessible style, using third person and moving freely between quite a large cast of characters. Most prominent of these are Alfred himself and Fleda, his daughter - a brave and intelligent girl who will appeal to young readers. There are also the voices and thoughts of various loyal followers, some courageous church leaders, and even the leader of the Danes, the dreaded Guthrum himself, so that we see his vulnerable side too. One person whose thoughts are unspoken is Cerys, a British wise woman with an extraordinary insight into people's hearts and minds. She is a powerful influence on Alfred, and brings a touch of believable not-quite-magic that fits well with the legend and the times. Warrior King draws together what, for me, were half-remembered fragments of Alfred's story, and weaves them into a coherent whole. Alfred was perhaps our greatest king, and yet we don't hear much about him now. His true story is inspiring, and Sue Purkiss has re-imagined it in a tale that keeps up its momentum throughout and builds to an exciting climax. She knows Somerset well, and her descriptions of the landscape through which her characters move add much to the appeal of this book. Published by Roundhouse Books, 2015. p/b and e-book. Thanks for this review, Ann. I thought of Sue's excellent book as soon as I saw the title shots for The Last Kingdom, with the "map of Britain" burning until the fire reached the edges of Wessex. Thanks for this lovely review, Ann!